It seems like an eternity since Paul released his stunning debut album “Tell Me Something” an album of music where he reinterprets some classic Genesis and Phil Collins tracks as well as some well crafted originals, the album featured some of the world’s most loved and renowned musicians. Yes it has been four years since “Tell Me Something” was released, but Paul has not been sitting around trying to figure out what’s next. Paul has been very busy between teaching and making his Big Screen debut as a villain in the upcoming movie Ryder due out soon, as well as working on his next release called “Rawfully Organic” due out early 2015. In the midterm Paul has released five singles to raise awareness for Autism which are available as downloads on iTunes, CD Baby, Amazon and other fine digital retailers. The music can also be purchased directly from Autism Unites and Melodic Revolution Records. For every song sold 25 cents will be donated to Autism Unites. Words & Music for four of the five tracks were written by Lee Curreri. Lee is a musician and actor and is best known as Bruno Martelli from the TV Series and Movie “FAME”. The fifth single is an unreleased dance remix of “Tell Me Something” from Paul’s debut album. There is a full length EP “Alone In The Crowd (songs for social awareness)” CD in the works and will feature all five singles and like singles a portion of the CD sales ($1.25) will be donated to Autism Unites. 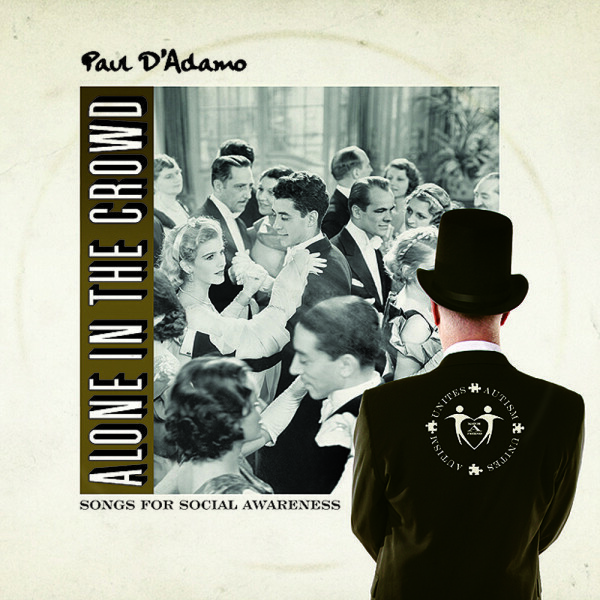 EP Title: Paul D’Adamo – Alone in The Crowd (songs for social awareness). The Reason For The Partnership Between Paul D’Adamo And Autism Unites. According to Paul. Shortly after I opened the D’Adamo School of Performing Arts in 2002, I was asked by a parent of 2 children with autism to teach them music. One was non-verbal and loved listening to music constantly. I had no previous experience working with children or adults with special needs, just a love of performing, recording, and teaching music. But my experience working with these 2 children changed my life and changed it for the better. As a signed recording artist, let me tell you … these comments are worth more to me than any Grammy or platinum album that I could ever hope to be awarded in my career. So why did I choose to support Autism Unites? It’s very simple. This organization is run with such tenderness and compassion, doing what’s best to make us all more socially aware of the indifference that these precious human beings often experience. This project also gave me the opportunity to work with a great musician & actor, Lee Curreri aka “Bruno Martelli” of the original hit movie and TV Series FAME. He’s an amazing songwriter and producer, and it was an honor to collaborate with him on this project. The rest can be told when you download our work, and you support the cause of Autism Unites!